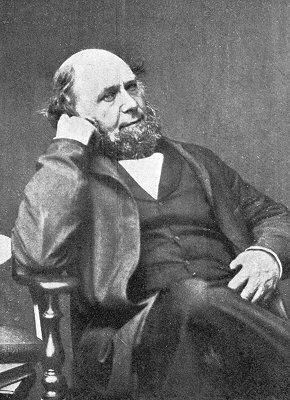 Samuel Griffiths is best remembered to-day as the author of "Griffiths' Guide to the Iron Trade of Great Britain", which was first published in 1873 but which was of sufficient lasting interest to merit a reprint by David and Charles in 1967. In the latter part of his life Griffith's fame rested on this book and the fact that he was the proprietor and editor of the London Iron Trade Exchange. But he was Bilston born (in 1814) and, in the earlier part of his life was famous - or perhaps notorious might be better - as a businessman in the iron trade and a councillor in Wolverhampton. Griffiths was clearly a clever man, full of energy and drive, and a prolific speaker and writer. But his enthusiasm sometimes ran away with him, and his business sense seems not always to have been of the best. He was no stranger to political controversy or bankruptcy. But he always bounced back. He seems to have been regarded as a rogue but a likeable one and his good heartedness was recognised. He eventually left for London sometime around 1866. Maybe Wolverhampton had become too hot to hold him. But London would also have attracted him as by this time his main business was as a publisher to the iron trade. In this he seems to have established a sound business and a sound reputation. He died in London in 1881. The story of Samuel Griffiths is presented here in a number of chapters. Click on the title of each chapter to read it. Information on the Griffiths family tree from Joan Bird of Australia, whose husband, Noel Bird, is a direct descendant of Thomas Griffiths, Samuel's brother. Griffiths' Guide to the Iron Trade of Great Britain, new edition, David and Charles, 1967, with an introduction by W. K. V. Gale. The Municipal Life of Wolverhampton, W. H. Jones, Alexander and Shepheard, London, 1903. Anthony Rose, Images of England: Whitmore Reans, Tempus Publishing Ltd., 2000. Report of a Trial, which took place at the Guildhall County Court, London, on Friday, July 13, 1849. The Public & Medical Men. Griffiths v Walford. Wolverhampton: printed at the offices of Joseph Bridgen, Darlington Street. 1849. (in a private collection). Election Poster by Saml. Griffiths, printed by Boden, Cheapside [Wolverhampton], 1865 (in a private collection).